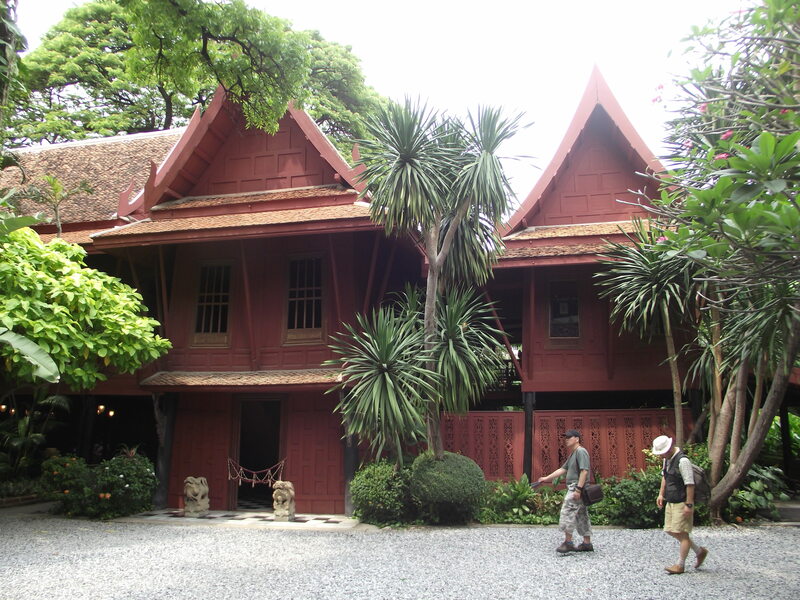 Not nearly as flashy and cosquelle as the Grand Palace, not nearly as crowded as Chinatown, not nearly as rabid and flea-infested as Khao-san Road, Jim Thompson’s House proved to be a lovely and peaceful excursion in Bangkok. In fact, for a second I really forgot I was in the middle of a mega Asian city. For those of you who don’t know, Jim Thompson was an architect who because a serviceman and a CIA officer during World War II, and in the process become enamoured with Thai culture, eventually divorcing his American wife and moving back to make Thailand his home. But he didn’t just stay in Thailand — he is also credited with taking Thai silk to the rest of the world in the 40’s and 50’s. Today, ‘Jim Thompson’ is the most well-known name in the silk business, and of course famous across Thailand and the world. Why his house is so famous is because he took six antique pure-teak houses from across Thailand, shipped them to Bangkok, and built himself a beautiful home in the middle of the city. Very annoyingly, we were not allowed to take pictures inside the house, but his personally collection of unique items across Asia was astounding. Fantastic wooden carvings from northern Thailand. 13th century stone Buddha statues. Chinese Ming vases. 500-year-old mahjong tables converted into a dining room table. Paintings from Burma, bowls from Cambodia, a chamber pot in the shape of a frog…. the list of beautiful and quirky items was endless. As we walked around in this fantastic teak home which one man obviously had such a vision for, I tried to imagine what it was like for him, waking up every day in a home smelling with the delicious aromas of wood, with birds chirping in the trees and frogs in the lush garden. Every single item in his home was specifically chosen to surround himself with. Every day he woke up to beauty — a beauty he had chosen and made. Jim Thompson disappeared in Malaysia in 1967, never to be seen again, his body never recovered. His home was turned into a museum a few years later, and all the items were donated. Now his house and lush gardens lay just a few minutes walk from the incredibly busy National Stadium Station, the huge MBK Shopping Complex, and a massive highway chock full of ancient coughing buses and millions of tuk-tuks and taxis. As I walked back to the train and got on line, I sort of got the feeling that perhaps Jim Thompson got the best of Bangkok, just at the right time…. a time that I suppose is too late to go back to.